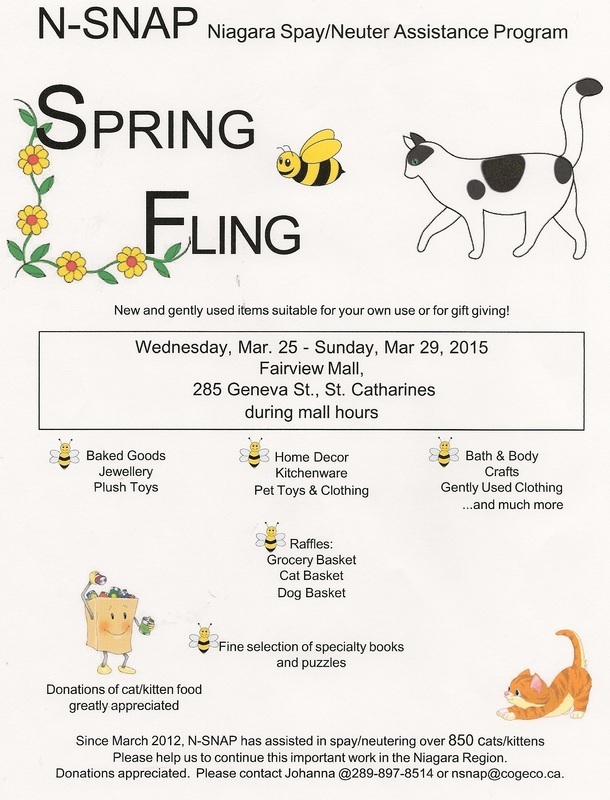 ​Please join us for our SPRING BAZAAR in the Fairview Mall April 24-28. Please click on the poster for details! Lots and lots of new and nearly new items to choose from at great prices! We will have baking and three raffle baskets as well. We are always in need of more good quality items for our sale. 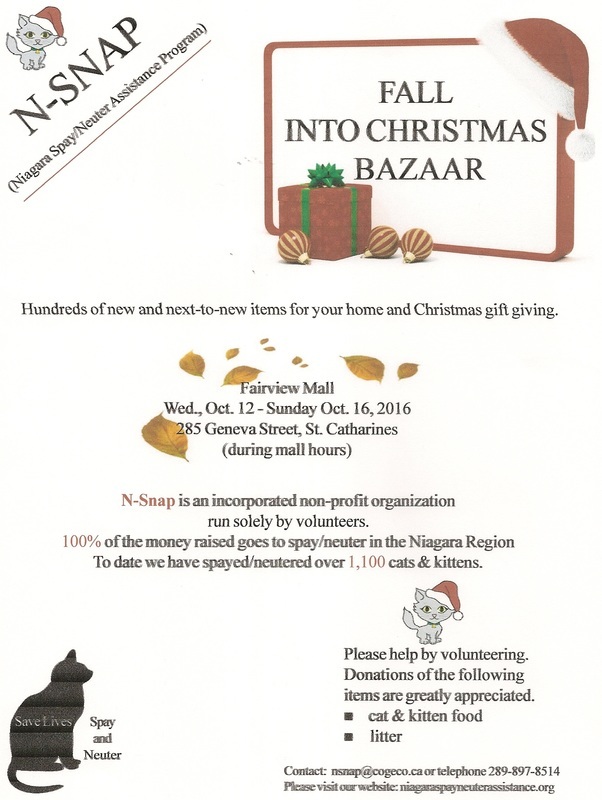 If you have any household items in good shape that you would like to donate please email us at nsnap@cogeco.ca We are looking for kitchen ware, china, framed prints, jewellery, collector plates,vases etc. Please note that this is not a garage sale: items must be in excellent condition. 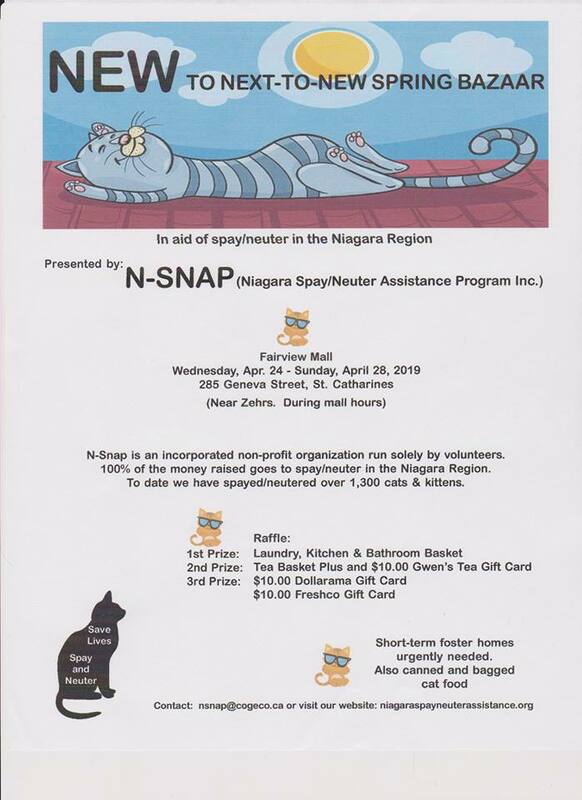 :-) All proceeds go towards spay neuter of cats in the Niagara Region. 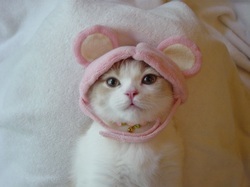 Meowy! ​The head of finance (pictured here) has finally worked it out. We made $1,915 at the book sale. Considering we lost a good day and a half due to the weather this is pretty good!! A heartfelt thanks to everyone who helped with the sale, to everyone who came out to support us whether by purchasing books or donating books, or donating cat food or by slipping some cash in our donation box. Together we made it work despite the obstacles thrown in our way by Mother Nature. A special thanks to Brian for driving the truck in the worst possible weather conditions. Brian never gives up no matter what! Welcome also to our wonderful new volunteers, Carol, Evelyn and Lisa. Our next sale is our SPRING SALE. Announcement coming soon. We need your help!! About a month ago a cat, now named Xavier, wandered into one of the feral colonies we manage. He never left the shelters we had out for the cats except to eat. The colony care giver noticed that he always had his eyes closed and that one of the eyes seemed infected. She trapped him and took him to the vet. He turned out to be a very shy, docile cat. At the clinic they referred to him as a “gentleman!” Xavier was diagnosed with a condition in which the eye lashes curl under and continually scrape over the eyes causing much pain and infection. Xavier is going to need surgery to correct this. Needless to say the procedure is costly (approx. $800) an expense not anticipated by NSNAP. So we are asking anyone who can contribute towards his surgery to do so. No amount is too small. Together we will get there. Xavier has already been neutered and vaccinated by us. He is estimated to be about 3 ½ years old. Once he has recuperated from his surgery we will be looking for a special forever home for this sweet “gentleman.” Donations can be made by email nsnap@cogeco.ca or by way of our donation button on our website under the “How You Can Help” tab. Thank you from all of us at NSANP and from Xavier. Our Raffle was a great success!! !Winners of our Fall 2018 Raffle: 1st Prize: Donna (no last name but a Toronto phone number) 2nd Prize: Dorothy Witusik from St. Catharines 3rd Prize: Vera Clay from St. Catharines. Congratulations to all the winners!!! A super great big thank you to the awesome Frakking Family for donating the prizes. A great big thank you to everyone who sold or bought tickets!! Our Raffle was a great success!!! 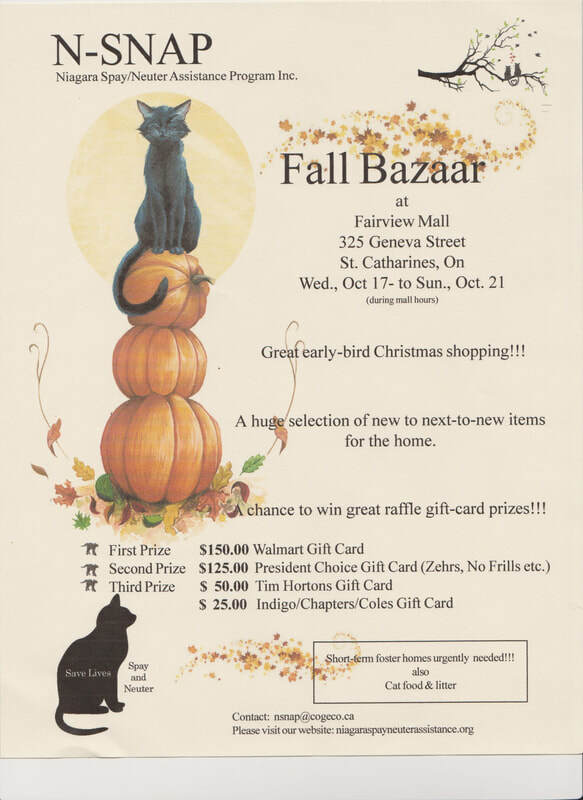 Please join us for our ​Fall Bazaar in the Fairview Mall Oct 17-21!! Lots of great items waiting for you!! We also have a great Raffle going on: 1st prize is $150 Walmart card, 2nd Prize $100 Zehrs card and 3rd prize $50 Timmy card plus $25 Chapters card. Tickets $2 each and 3 for $5. Please see the poster for details. Hope to see you there!! Please join us for our Giant Book Sale July 11-July 15 in the Fairview Mall in St. Catharines during Mall hours!! We are inside the mall near Zehrs. We have a wide variety of fiction and non-fiction books at great prices. See you there!!! It is kitten season!! 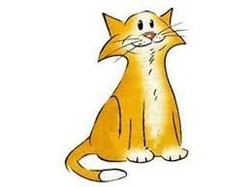 Donations of cat and kitten food (especially canned food) and litter is greatly appreciated. Please join us for our fabulous Cat and Dog Basket and Gift Card Raffle at Global Pet Foods in the Grantham Plaza! June 4-June 30th. Please read the flier for details!! Thank you to all who came out and supported this event!! We made just over $700. Please join us for our book sale in the Fairview Mall July 19-23!!! Please join us for our next sales event: N~SNAP BOOK SALE in the Fairview Mall January 18-22, 2017!! Thank you to everyone who made our Fall into Christmas Sale a great success. Thank you to our wonderful team of volunteers, to everyone who shopped, donated or who came out to cheer us on. Together we made $3092. All for the cats of Niagara. Winner of our grocery raffle basket plus 3 gift cards was Ms. Sue Mulder of St. Catharines. Congratulations Sue! In honour of St Francis of Assisi Feast Day please join us for the Blessing of the Animals at Fonthill Pet Valu Saturday, Oct 8 at 11 am. Father Paul McDonald of the Scared Heart Parish in Chippawa will bless the animals currently up for adoption at the Fonthill Pet Valu and will also bless any animal (or picture of an animal) brought to him by customers for blessing. Please join us for our Fall Into Christmas Sale in the Fairview Mall in St. Catharines October 12 - October 16, 2016!! We have a ton of great stuff at gret prices, most of it suitable for gift giving!! As always, we will have baked goods as well! Also lots of gently used and new clothing and jewellery!! The cats finally cleaned everything up and tallied all the money from what turned out to be a very RAINY NSNAP Garage and Plant Sale!! We made $1557. We, and the cats, are delighted with that and once again want to thank all our AMAZING volunteers for all their hard work and support. You know who you are and we think you rock!! And we thank everyone who came out to shop too! 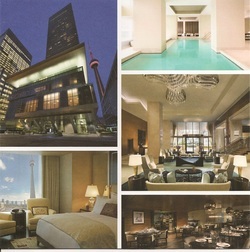 See you at our next sales event which is our Book Sale in the Fairview Mall July 20-24!!! 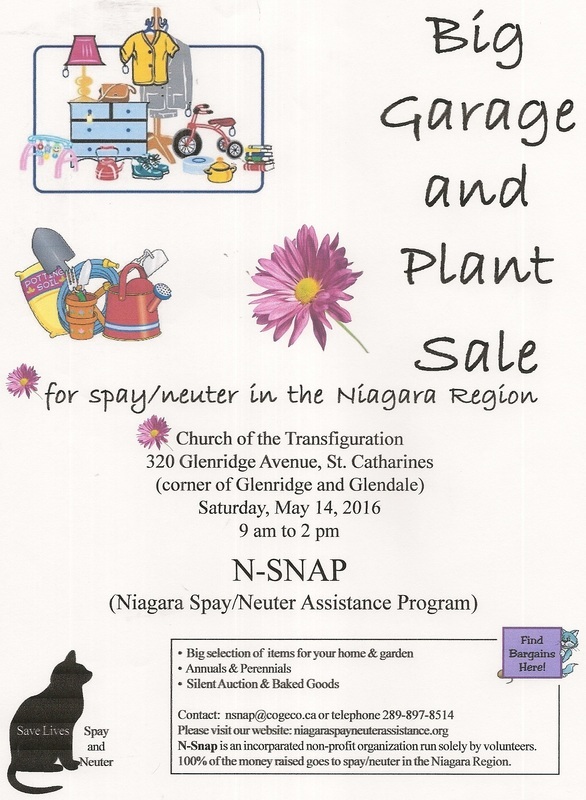 Please join us for our 5th Annual Garage and Plant Sale May 14, 2016!! Please note that this year we are at a new location: The Church of the Transfiguration, corner of Glendale and Glenridge in St. Catharines!! As always, we will also have a small silent auction, raffles and a bake sale!! 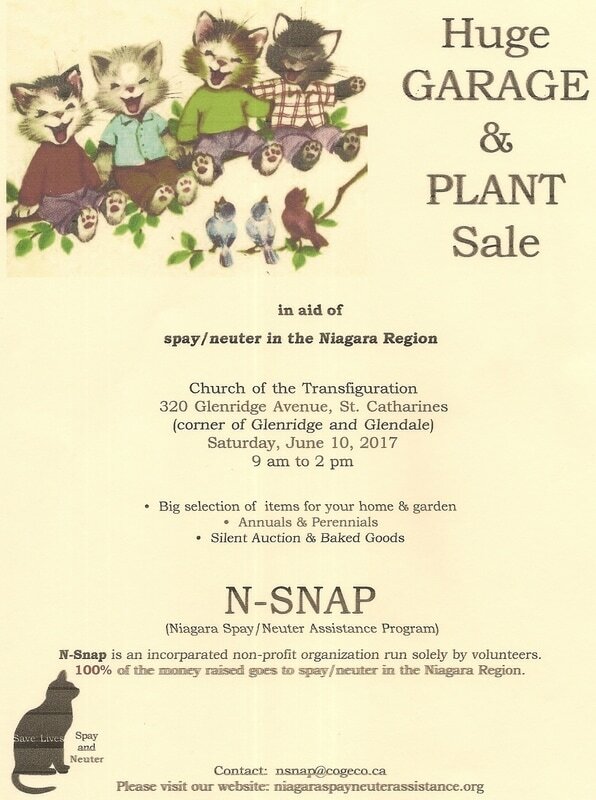 If you have any plants from your garden to donate (these should be dug up a good 3 weeks before the sale so they can acclimatize to a pot) or if you have stuff to donate please contact us at nsnap@cogeco.ca or call 289-897-8514. Working together for the cats of Niagara!! The N~SNAP Spring Sale made $3562!!! So another successful sale!!! Once again a great big THANK YOU to all our amazing volunteers and supporters, to everyone who shopped, donated and baked. Without such a supportive community this would not be possible. 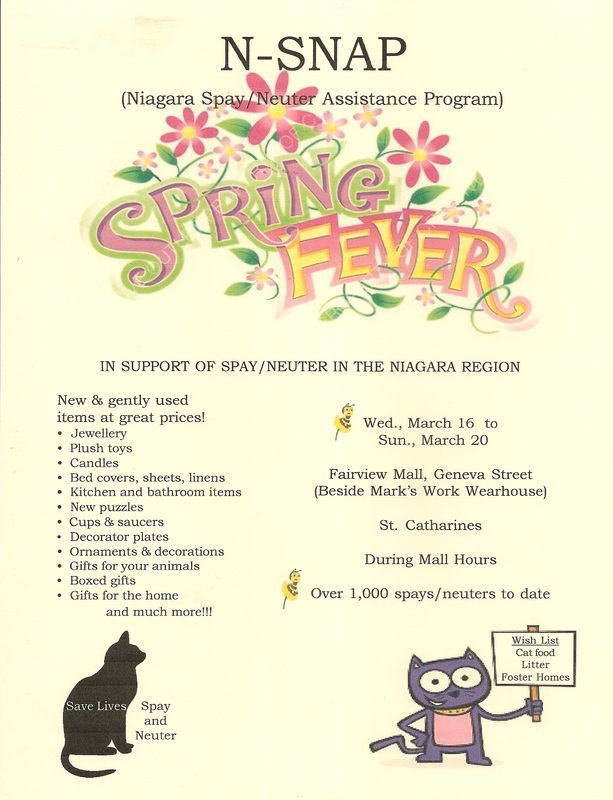 Working together for the cats (and their people) of Niagara!! 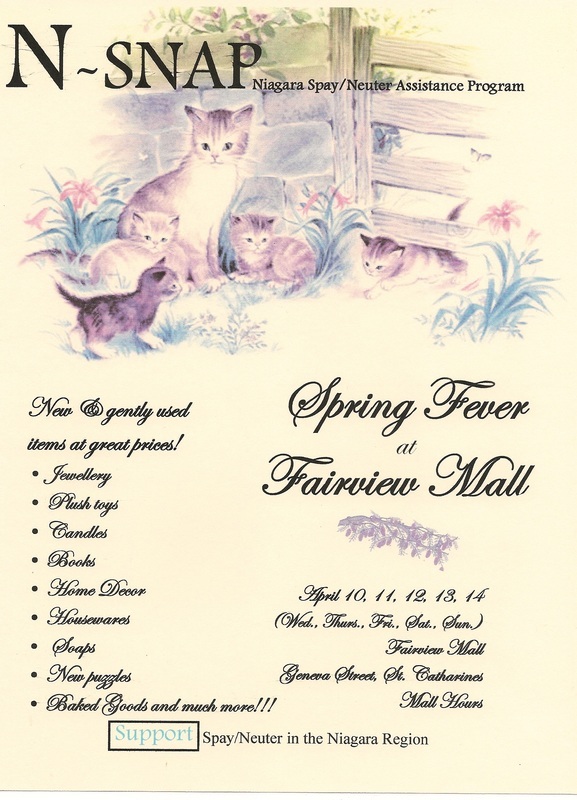 Please join us for our Spring Fever Sale at the Fairview Mall March 16-20 in front of Mark's Work Wearhouse!! If you have any items you wish to donate to the sale please email us at nsnap@cogeco.ca or call us at 289-897-8514!! Please see the poster below for details! Happy Cat says we made $2401.25 at our book sale in the Fairview Mall!! Thank you once again to all our amazing volunteers, supporters, donors!!!! Working together, tirelessly, for the cats of Niagara!! Please join us for our book sale in the Fairview Mall. Click on poster for details. Lots of awesome reads at great prices. The more books you buy the more you help the cats of Niagara! Wed. Jan 20- Sunday Jan 24 in the Fairview Mall St. Catharines!! Come on out and join the fun!! 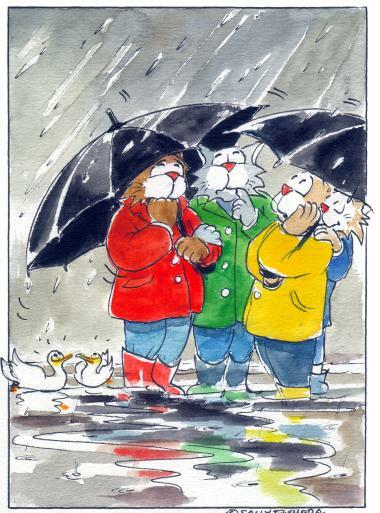 And help the community cats at the same time!! 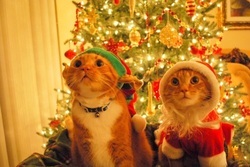 Please join us for our Early Cat Christmas Sale in the Fairview Mall!! We cannot thank our supporters and volunteers enough!! They are the best, best, best!!! They worked like troopers and/or came out to party. 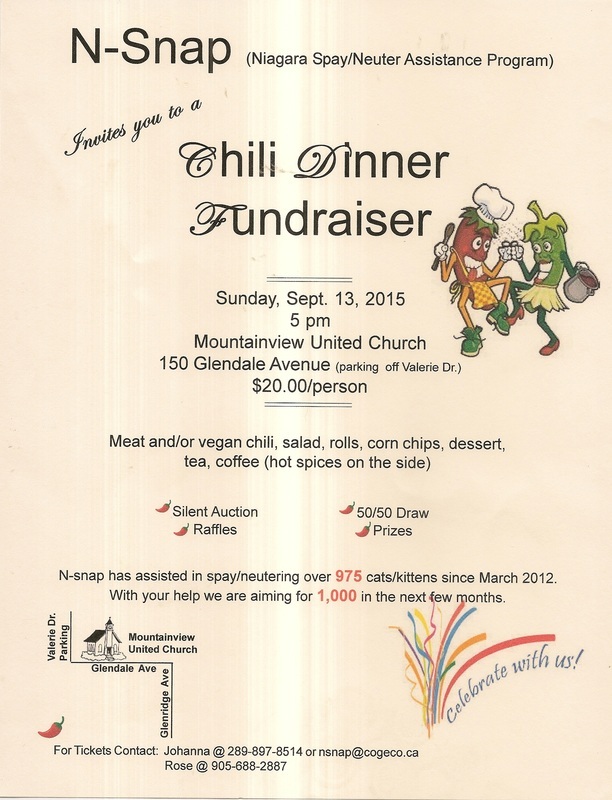 Together we made $2660 on our Chili Dinner. Special thanks to Gloria for her great catering, to the vegan Duchess for her vegan chili, to Janet for her awesome baking, to Tracy and Jutta in that hot kitchen--both cool under great pressure. Special thanks to Irene for all her help and for producing a great NSNAP banner. And thank you to our many other hard working volunteers--too many to list--who made this dinner work. And of course a great big thank you to those who came out to dine (some from as far away as Brantford), for without them this would not have worked!! 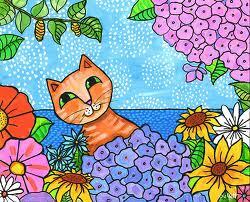 Purrs and head bonks from the community meows!!! THANK YOU!!!! Thank you to all our wonderful, hard working volunteers and to all our supporters. Together we made $2669 at our book sale. We are well pleased!! 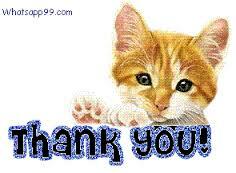 Thank you also to all who donated some much needed cat food!! 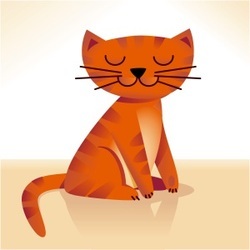 This little snoozing cat is showing us what team N~SNAP feels like doing after our very busy and successful Spring Fling Sale which raised $3502. A great big hearty THANK YOU to all our hard working volunteers, and to all those who came out to support us whether by shopping and/or by donating goods, money and/or cat food. We truly appreciate all of you. 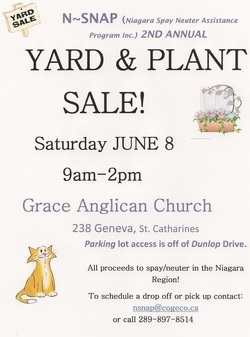 You made the sale a success which will allow us to help the cats of Niagara!! The figures are in: we made $3008 at our January Book Sale. We also received some much needed donations of cat food. So, we are very happy!! Once again a huge thank you to everyone who participated in this event. And there were lots of people who participated: our awesome set up crew, drivers, sales crew, take down crew, all the people who came out to shop and/or donate, people who spread the word about the event. We are blessed with a lot of caring, hardworking, animal loving people in this region. THANK YOU!! Join us January 21-25, 2015 for another of our amazing book sales in the Fairview Mall. Stay tuned for details!! 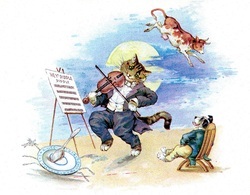 Kitty is doing the happy dance and so is team N~SNAP!! We made $4,343 at our Fall into Christmas Sale!! As always, we are grateful and indebted to all of our amazing volunteers who worked tirelessly and to everyone who came out to support the sale--whether to shop or to donate items, cat food or money. To all of you a great big: THANK YOU!!! 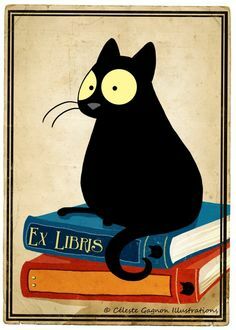 Happy Cat sayz: "N~SNAP did well at their book sale! They made $2582 for the cats of Niagara!!" And he is right! Plus we had some good donations of cat food. So once again we wish to thank all our donors and all our loyal supporters and all our loyal volunteers!! You are all THE BEST!!! 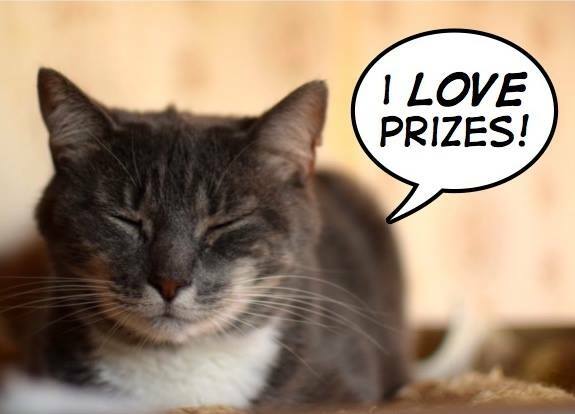 Winner of the Cat Raffle Basket: Ms. Guillain Gauvin of St. Catharines. Winner of the Dog Raffle Basket: Mr. David Malone of St. Catharines. Please join us for our fabulous book sale in the Fairview Mall June 18-22!! Pick up some great reads and help the animals at the same time! 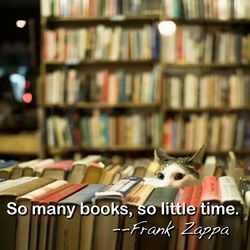 We have lots of mysteries, inspiration, philosophy, world religions, novels, literature, gardening, pets, cooking and much ,much more!! This time we have a great selection of records too!! Some thing for everyone, so don't miss out!!! The figures are in. We made $2250 at the 3rd Annual N~SNAP Garage and Plant Sale. Over $800 more than last year!! We have to say once again: we are truly graced with an amazing team of volunteers, supporters and donors. Each and every person contributing, in his or her own singular way, is vital to the event. And, as anyone who attended this event will know: it is true that it takes a village!! So, well done EVERYONE!!! THANK YOU!! Winner of the Dog Raffle Basket: Ms. Cheryl MacKay, St. Catharines. Join us for our Fun Plant & Garage Sale May 24th!! We have lots going on, including a Silent Auction and Raffle Baskets, Rummage Table and White Elephant Table, lots of Plants and a catered $4.99 luncheonette. Grace Anglican Church on Geneva. See flier for details!! 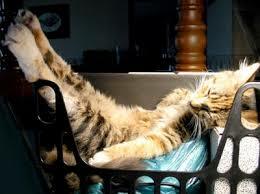 Over 700 cats spayed/neutered since March 2012!! 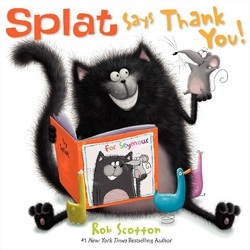 Splat the cat says "THANK YOU!!!!" And we at N~SNAP say THANK YOU too, to everyone who made our book sale a great success. From our amazing, hard working, dedicated volunteers, to all the people who shopped, to those who donated books, food and/or cash for the cause. We are truly blessed to have so many people working together to help the cats of Niagara. Together we were able to raise $3380 for our spay/neuter initiative!! THANK YOU,THANK YOU, THANK YOU!!!! Stay tuned for our Easter Sale. Dates to be announced soon. Please join us for our fabulous book sale in the Fairview Mall January 15-19!! Pick up some great reads and help the animals at the same time! We have lots of mysteries, inspiration, philosophy, world religions, novels, literature, gardening, pets, cooking and much much more. Some thing for everyone, so don't miss out!!! To donate books email us at nsnap@cogeco.ca or bring your books right to the sale. Books must be clean and in very good condition. No encyclopedias, text books or readers digest please. The N~SNAP Christmas in the Mall Event was a great success!! A lot of hard work and a lot of dedicated volunteers, donors and shoppers allowed us to raise $3611.10!! Thank you to EVERYONE who helped make this event a success. Money made in the Niagara Region for animals in the Niagara Region!! Ho, Ho, Ho!! Please join us for our Annual Christmas in the Mall Event in the Fairview Mall St. Catharines, Oct. 30-Nov. 3, 2013!! We will be in front of the Future Shop. Lots of great quality new and gently used items for sale, many suitable for gift giving!! And our prices are always great!! If you are downsizing or someone you know is downsizing or if you received gifts you really do not need or want, please consider donating these to us for our Christmas Sale!! You will be helping a lot of animals!! Please join us for our fabulous book sale in the Fairview Mall August 7-11!! 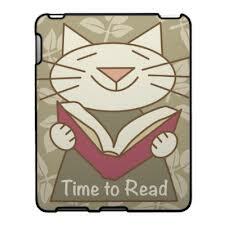 Pick up some great reads and help the animals at the same time! We received an extra special donation of really great cook books!!! But we also have lots of mysteries, inspiration, philosophy, world religions, novels, literature, gardening, pets and much much more. Some thing for everyone, so don't miss out!!! A great big THANK YOU!!!! 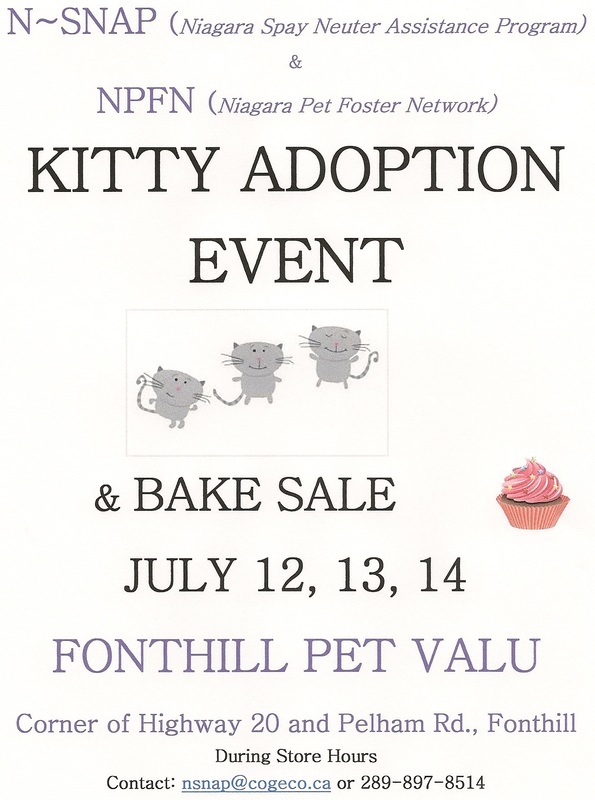 to Fonthill Pet Valu for graciously hosting an N~SNAP/NPFN adoption event and bake sale this past weekend and for holding a food drive and BBQ for us to boot!!! Together we raised $397.50 for N~SNAP spay/neuter fund, received tons of much needed canned kitten food, raised some additional funds for NPFN, found homes for at least 3 NPFN kittens--and possibly 1 AAS kitten. Fonthill Pet Valu is the best!!! They went above and beyond!!! And a great big THANK YOU to all of you who made a special effort to come out to donate to this event!! We have the best supporters!!! Our next event is the N~SNAP giant book sale in the Fairview Mall August 7-11. Be sure to join us!!! Please join us for our adoption event July 12, 13, 14!!! We will be working together with Niagara Pet Foster Network and Animal Assistance to help find cats and kittens loving homes!! All of the cats and kittens are sponsored so adoption fees range from $50 - $100 which includes the spay/neuter, first vaccines, microchip, internal/external parasite control and 6 weeks free pet insurance. Thank you to everyone who helped to make this event a success!! Together we were able to raise $1,418.30 for the animals!!! See you all next year!!! Join us for our Book Sale in the Fairview Mall January 16, 17, 18, 19, 20, 2013. We will be inside the Mall in front of Zehrs. Lots and lots of great titles at great prices!! We have an amazing array of categories: gardening, cooking, sport, romance, mystery, religion, philosophy, psychology, women studies, literature, novels, to list only some!! Inside the Mall in front of Zehrs during Mall hours. If you have books in good condition that you would like to donate to us for this event please either bring them directly to the sale or give us a call at 289-897-8514 and we will arrange for pick up. Our mini-silent auction has ended. Thank you to everyone who bid on these three fabulous items to make this a success!! Some awesome items including a Stay in a Luxury Deluxe Room at The Ritz-Carlton, Toronto for up to 4 people valued at $550 CAD!! Please visit our face book page for this silent auction event!! N~SNAP is also auctioning off a The Steven and Chris VIP Experience!! You know: the DESIGNER GUYS!!! You and 3 guests will attend a taping of the show and get VIP access. Front row seats, a chance to meet the guys and a special gift package will be yours! Our Christmas Treasures Event in the Fairview Mall November 7, 8, 9, and 10, 2012 was a great success!! We raised $3,955. Thank you to everyone who donated items, to all our hardworking volunteers and to everyone who came out and shopped!! Our first Annual Dinner & Silent Auction at the Club La Salle, Oct 14, 2012, was a huge success!! Over 150 attended this event! We were blown away by all the supporters who came out and the many, many volunteers who worked hard to make this event a success. A great big thank you to all who came out and to all our volunteers!! You rock! !